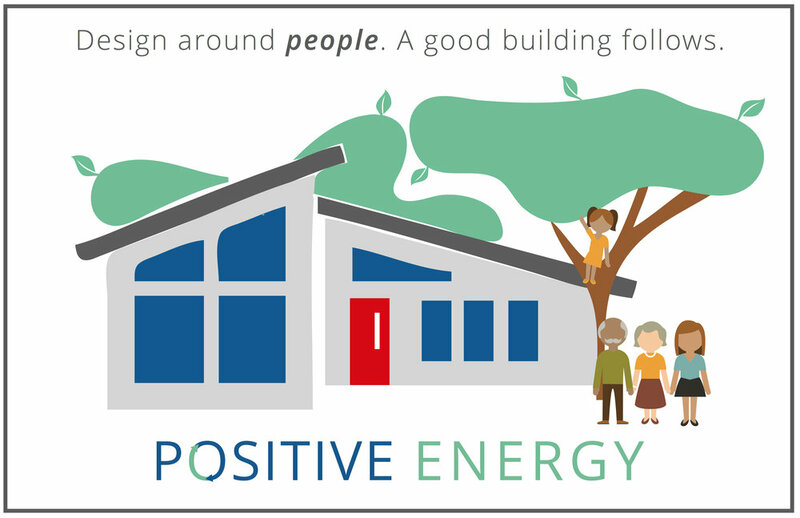 For the last decade, Positive Energy has used scientific research and practice in our design work to support architects and builders who want to make their homes healthier and more resilient. Through the years doing this work has taught us a lot about how much room there is for architects, builders, HVAC installers, and homeowners to make more informed and empowering decisions about their projects. Sadly, much of construction industry is still trafficking in outdated ways of thinking and practicing, but among those in the vanguard, the focus of architecture is widening. We’re seeing a massive shift in focus on the effects that buildings have on the people live in them. My House Can Affect My Health? Just after World War II, suburban sprawl began with developments like Levittown. Not only were developments like this codifying racist housing policies, but they were also tearing at the fabric of quality building processes. Gone were the guilds of craftsman and entered was the era of exploitable, interchangeable labor that we still know today. Levitt envisioned Henry Ford's assembly line being able to build homes faster than anyone else. He had dollar signs in his eyes and had no notion that this change in construction practice would contribute to creating boxes for people to live unhealthy lives for generations to come. This Zeitgeist lives on today and is evidenced in almost every single growing city in America. The values that have been, for generations, instilled into the construction industry are centered on first cost and speedy delivery. It's a baton-hand-off, everyone passing on the liability to the next person down the chain. All the while we, the homeowners, have become comfortable with this status quo, assuming that the product we're getting is the best possible for the money we’re spending. It's become part of our vernacular in real estate marketing with concepts like a "starter home." We think, "well it looks like a house and it has that tile I like" so we buy it. While there's still some part of our brain that recognizes there's more that we don't know about the house, those thoughts get put on the back burner because we live complicated and busy lives. In the early aughts, as the political economy changed, many of us began to value the illusory "energy efficiency" that marketers exploited to give a sense of added value, but we rarely experience a truly well designed and built home. Even fewer still know how to assess the air quality and thermal comfort considerations that went into our home's construction. This is not to say that these action are done by evil doing bad people, instead many just don't know and we, the consumers of homes, don't ask because we incorrectly assume all is well. The current state of housing is in a quiet crisis. Because we all spend a lot more time indoors than most of us realize, our homes are our primary exposure to pretty much all the air we’re ever going to breathe. According to the good folks at the Lawrence Berkley National Labs, we spend 90% of our lives inside and about 70% of our lives in our homes. To really make for a dire story, the fact remains that most of us don’t even realize that all that time indoors has a detrimental effect on our health and well-being, similar to poor diet or lack of exercise. These negative health outcomes are due to the startling fact that pollution is often worse indoors than outdoors. The poor air quality in our homes, our offices and our schools is closely associated with diseases and disorders like asthma, respiratory disease, heart disease and chronic obstructive pulmonary disease. The air inside our homes and buildings can be up to five times more polluted than the air outdoors and leads to 1000 times the pollutant uptake. Indoor air comes from outside air, but is filled with added pollution from all the materials around us. Anything from paint and cleaning products, to furniture and upholstery, to plastic toys and carpets, can trap dust and become a pollutant. Children’s bedrooms are often the most polluted rooms in the house. Cooking, burning candles, drying clothes indoors, and even just walking in off the street all adds potentially toxic impurities to the air. Elevated humidity leads to mold growth and their fungal spores further contaminate the air. Like we said before, it’s science. And we dig into a lot of it to make well informed design decisions that enable the project teams we work with so that our clients’ homes will have the conditions for healthy living. It’s building science in action! — Sundell, J. (2004), On the history of indoor air quality and health. How Do We Create Healthier Homes? The million dollar question! You’ve started the process just by reading this webpage and asking questions. You’re probably realizing in your research that it’s time to rethink home design and architecture, prioritizing fresh, filtered, dry air. This starts in the design stages of a home, well before it’s ever built. Express your concerns about indoor air quality to your architect and builder. Make sure they’re willing to lead the charge in providing you and your family with good air quality. Absolutely discuss purchasing building materials and furnishings that are low-emitting, but more importantly make sure they’ve got a team of well qualified experts that can help them with the design. If they say something like “Oh the builder/installer will take care of that for us,” hit the brakes hard. In fact, just send them this page to read. If they can’t recite the 5 Essentials of a Healthy Home that we lay out below, it’s time to have a more serious conversation about that contract. The old adage goes “Well, homes need to breathe.” Nothing could be further from the truth. People need to breathe. Homes need to dry. Healthy, efficient buildings shouldn't leak. Leaky buildings are unfortunately a staple of our industry norm. As you know, making change in the construction industry is like turning a super tanker. It doesn’t happen quickly, but super tankers do turn. They use a trim tab to enable the large rudder to turn the shift. What is needed now is a fresh take on the societal forces resisting change in construction practices and energy code. We need a trim tab to start the process of countering these stuck forces. The American Society of Heating, Refrigerating and Air-Conditioning Engineers (ASHRAE) recommends a ventilation rate of 0.35 ach (air changes per hour) for new homes, and now many high performance homes are built to even tighter specifications. Particular care should be given in such homes to preventing the build-up of indoor air pollutants to high levels. This really is ground zero to prevent unknown sources of air pollution from penetrating the walls and coming into the space. Make sure your architect and your builder are on their game when it comes to enclosure details! As many of you already know, we're interested in indoor air quality and more broadly interested in the health impacts of the built environment. It's fundamentally changing the way we design, build, and specify. The materials we use have properties that can either help or harm the people that come into contact with them. There is a lot to say about the emissions we bring into a space and how they off-gas, but if you want to dig into one of the most alarming, read more about brominated flame retardants. Flame retardants are compounds added to manufactured materials, such as plastics and textiles, and surface finishes and coatings that inhibit, suppress, or delay the production of flames to prevent the spread of fire. Turns out, they’re not very effective and super toxic. When water gets into damaged, poorly designed, and improperly maintained buildings, it’s a big problem. In fact, it’s the main source of building-related illness from mold exposure. Common sources of moisture in buildings can include: leaks from plumbing, roofs, and windows; flooding; condensation on cold surfaces (e.g., poorly insulated walls and windows, non-insulated cold water pipes, toilets), poorly maintained drain pans, or wet foundations from landscaping or gutters that direct water into and around a building. These are all things that can be solved with good design. Secondary sources of moisture include water vapor from inadequately vented kitchens, showers, or combustion appliances. Excessive moisture collection in buildings creates favorable conditions for mold growth, which, if left unchecked, can actually destroy the surfaces they grow on. Moisture and mold growth can accumulate in materials such as wallboard and carpeting without being noticed even in buildings with good housekeeping and maintenance. This is why humidity control is an essential part of any good mechanical design. There are lots of particles in our homes, but one of the most prevalent particles in our every day lives that we don't associate with negative health outcomes is dust. There are so many contaminants residing in common household dust. Most people don’t realize that these lead to toxic exposure. We get exposed in a lot of ways - dust that sits on a person’s clothes, furniture, and other upholstered materials is continuously suspended and resuspended through normal activities like walking through the house, vacuuming, or folding laundry. In fact, people have a personal cloud of resuspended dust around them as they go about daily activities, not unlike the famous Pigpen character in the Charlie Brown cartoon. When the particles are resuspended, exposure can occur through inhalation. There are also chemicals in the air that stick to dust, which falls onto the skin and enter our bodies via dermal absorption. And we incidentally breathe in all this bad stuff when dirt and dust accumulate on our hands and are transferred to food or are ingested directly through hand to mouth contact. Adults ingest up to 100 mg of house dust per day and children up to 200 mg per day. Higher ingestion rates in children are due to the greater amount of time they spend in contact with the floor and other surfaces, and higher frequency of hand to mouth behavior. It’s important to think about all this dust that enters our body because dust is a sink for all kinds of potentially harmful agents - toxic outdoor particles that get inside, viruses, bacteria, chemicals, allergens (pets, mites, mold spores, pollen),building materials, dander, fabric fibers, and paint flakes that contain lead. Unlike chemicals in the air, chemicals in dust can continue to expose occupants long after the sources have been removed so they’ll stick around for years. For example, flame retardant chemicals that are used in consumer products migrate out of those products into air and dust. In fact, the amount of a chemical that is present in indoor dust can be directly correlated with amount of that chemical found in the blood of people living and working in those environments. Yikes! A well designed mechanical system will include multiple source points of filtration. This level of filtration goes well beyond the standard HVAC filter that most people have in their homes. Ventilation in buildings is required to bring fresh air in from outside and dilute occupant-generated pollutants (e.g., carbon dioxide) and product-generated pollutants (e.g., volatile organic compounds). If mechanically ventilated, a building’s mechanical system is designed to bring in outdoor air, filter that air, and deliver it to occupants. This doesn’t always happen, even on some of the most expensive houses in the world. But even with proper ventilation, the concentration of pollutants indoors can be higher than concentrations found outdoors. Outdoor pollutants, like PM2.5, can come indoors through several routes, one of which is through the mechanical system if the air stream is not properly filtered. Because people spend so much time indoors (90% or more for many people), most of a person’s exposure to outdoor air pollution may occur indoors. It’s important to remember that ventilation without humidity control, in a hot humid climate like Austin, can cause serious thermal comfort issues (not to mention all the associated indoor air quality concerns associated with elevated humidity). This happens when people install an ERV, but don’t install a dehumidifier. There are a number of ways that you can ventilate without an ERV that still allow you to control humidity. A good mechanical designer will consider the project’s budget goals and optimize the best ventilation outcomes accordingly. So How Does Become Real? Your architect, builder, and HVAC installer should all be working as a team with your mechanical engineering firm to ensure that good building science principles are incorporated into the home’s design, the construction process and details, and the thoroughness of the installation. The last thing you want is your project team creating a pollutant-filled-science-experiment out of your home. And it definitely requires buy-in; the team needs to be of one mind and ready to take on the challenge of integrated project delivery. Learn more about how Positive Energy contributes to a healthy home through our design engineering services. We’re not like other mechanical engineering firms or even like other building science consultants. We believe the growing connections between the health sciences and the building sciences are already central to understand the intersections of social justice, global health issues, and deep sustainability. It all comes together in housing and we think the industry that delivers houses can do a whole lot better than it is right now. Hear one of our podcast episodes on these 5 principles for a more in depth dive into how we can think better about designing, building, and passing on healthy homes for generations.